MINO & OV Ranges to 250°C. The exterior is constructed from sheet steel finished in an easy clean pale grey epoxy powder coated paint. The interior is made from mild steel coated with aluminium (CLAD), with a stainless steel chamber available as an option. 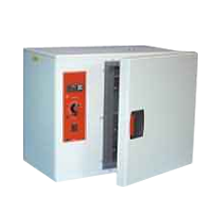 A range of highly efficient, reliable, and uniform temperature ovens, suitable for drying, warming and curing for general laboratory and industrial use. Fitted with a top vent, fixed shelf runners and removable chrome plated wire grid shelves. 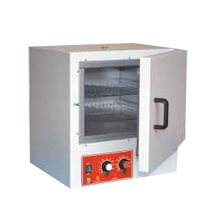 High quality inconel sheathed elements are positioned below the chamber floor for natural convection units and around the air circulation fan on the back or side wall of the chamber for ovens fitted with a fan. On the vertical style units (MINO) the controls are fitted below the door. On the horizontal style (OV) the controls are to the side of the door. The controls on the basic MINO models consist of a direct reading thermostat for control, and for safety, an independent adjustable over-temperature protection thermostat is fitted as standard on all models. On the OV and larger MINO models, or as an option on smaller MINO models, a microprocessor based digital temperature controller with set-point and process display is fitted to provide accurate fully automatic control.